When the Khmer Rouge took over Banrith Yong had just finished High School, and since much of Banrith's family was with the government they took everything. He lost both parents 2 brothers and 3 sisters. 70% of his family was killed. Separated from his family, Banrith survived the "killing fields" and was sent to a work camp— a prison without walls. He was forced to work with very little food. This was the regimes way of killing softly instead of killing right away. ​Yong escaped from three of these work farms, assuming he would die whether he stayed or left. Eventually he fled to Thailand where he made it to the Khao I Dang refugee camp. It was here he met Pat Walker and the rest of the first health volunteers of the American Refugee Committee. When Banrith first arrived at the camp the staff thought he had been luckier than most. His face was round and plump, then they realized that his body was swollen from the edema of kwashiorkor (a form of malnutrition). Banrith informed them he had just finished High School when the Khmer Rouge took over. Since he knew how to speak a little English he volunteered to work as a translator and eventually was trained as a paramedic, caring for the patients at night. After Banrith Yong left the Khoa 1 Dang refugee camp in Cambodia, he went to Switzerland where his eldest brother was attending a university. It was here Yong began his culinary training in the art of French cooking at the Eurotel in Fribourg. He also worked at Eurotel Neuchatel and was a chef at Schloss Bottstein. He worked and earned his culinary certificate on-the-job with well-known chefs. "The school was as good as Cordon Blue in Paris," Banrith says. Upon graduation he responded to the urging of Pat Walker to come to Minnesota. ​In the United States he cooked at many establishments including the swanky Whitney Hotel. His toughest challenge was convincing employers he knew classic French cuisine despite his Cambodian appearance. "I don't have a French face," Yong laughs. In the year 1998, in the small town of Jordan (southwest of Minneapolis), Banrith Yong along with his wife Joleen and their family decided to open the European restaurant "Suzettes". As a result of the their amazing work ethics and Banrith's first class culinary skills, Suzette's is frequented by those near and far and has become a popular meeting spot for those meeting-in-the-middle between Mankato and the Twin Cities. Yong makes homemade soups and dressings and the food is fresh, never frozen. He shops for the food he prepares almost daily. Fresh is the name of the game. In the warmer months Banrith grows herbs and vegetables in a garden behind the restaurant, which are all used in his cooking. 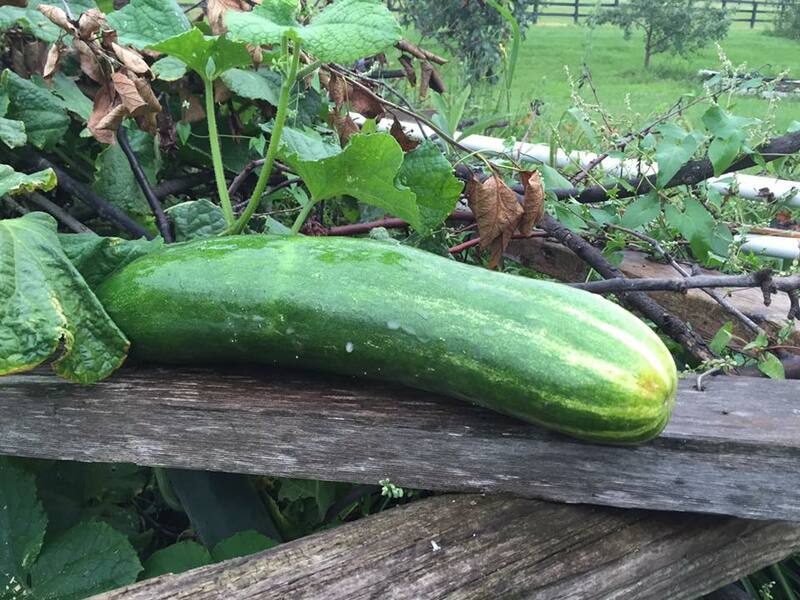 Pictured below is a cucumber from Yong's garden in 2016. This cucumber was measured at 14.5 inches!